Darjeeling: Two bhoomiputras have withdrawn from the Lok Sabha contest in Darjeeling, where the main contenders are GJM (Tamang)-Trinamool and GJM (Gurung)-BJP. R B Rai of Communist Party of Revolutionary Marxist and Swaraj Thapa (GJM-Gurung) withdrew their nominations. While a CPRM spokesperson spoke of unity among Gorkhas, Thapa said votes should not go to parties that oppose the concept of Gorkhaland. Chhetri said his party would take 3-4 days to announce which side it would support. Two bhoomiputras have withdrawn from the Lok Sabha contest in Darjeeling, where the main contenders are GJM (Tamang)-Trinamool and GJM (Gurung)-BJP. 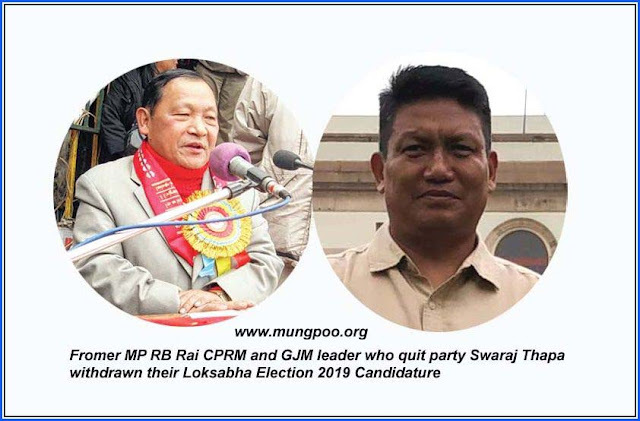 R B Rai of Communist Party of Revolutionary Marxist and Swaraj Thapa (GJM-Gurung) withdrew their nominations.